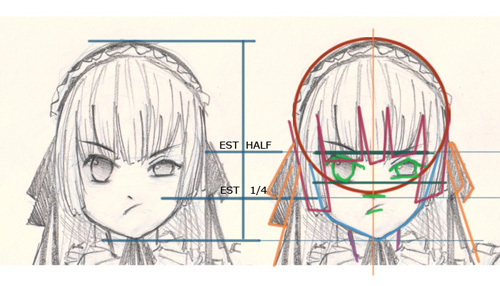 How to draw Manga Victorique from Gosick -ゴシック- This video tutorial shows you how to draw Anime character Victorique. It also shows you how to draw a long straight blonde Anime hairstyle. She also has beautiful bow decorates on top of her head. I am not sure if I should call it Anime or Manga because it has both versions. This should be easy for every artist to follow. If it is a bit too fast for you, press pause. Then you can keep drawing along. You will find video tutorial on the top. You can scroll down further to see step by step images with instruction. 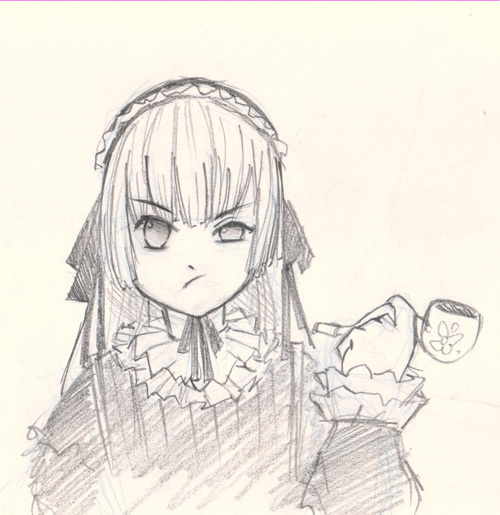 Learn to draw Manga Victorique. Drawing and sketching anime technique for manga, cartoon and comics. Learn to draw with tips from a professional concept artist. Basically when drawing a character no matter what style of drawing you are trying to attempt. You should not think too complicate, try to keep it simple. I usually look at the feature and try to break it down into basic shapes like rectangle, oval, circle, etc. Do not let the organic form intimidate or fool you. You have to look at the body of human form and break it down into the most simple shape that are easy for you to start off with first. The story takes place in 1924 in a small, French-speaking fictional European country of Sauville. The story centers on Kazuya Kujo, the third son of a Japanese Imperial soldier, who is a transfer student to St. Marguerite Academy, where urban legends and horror stories are all the rage. There he meets Victorica, a mysterious yet beautiful and brilliant girl who never comes to class and spends her days reading the entire content of the library or solving mysteries that even detectives can’t solve. The series mostly focuses on Kazuya and Victorica getting involved in different mystery cases and their struggle to solve them, at the same time forming important bonds with different people. About Victorique de Blois, the heroine of the story. Victorique has the appearance of a small (4′ 7″), almost doll-like, girl with long golden hair and emerald eyes and a voice that sounds exactly like that of an older woman. Another important part of Victorique’s appearance is a pipe that she smokes when thinking about something; though in the anime, it is never shown to be lit or showing her smoking due to her young age. She spends her days at the conservatory at the top of the library, reading several difficult books, often in different languages, simultaneously. She points at one wall of the library and has told Kazuya that she has read almost all the books over there. Along with her sharp tongue, abusive bluntness and eccentric attitude, she possesses amazing detective skills. Below are step by step images to help you follow along with the video drawing tutorial.